For those in search of a good night's sleep, what could be better than lying down on excellent bed sheets that you picked yourself? Comforters, duvets, pillows, bed scarves--all of these and more are the elements of a stylish, relaxing space. Choosing the best linens for the bed can be both fun and creative. For an elegant overall appearance that's low maintenance, try a 7-piece matching comforter set. These sets include a comforter, bed skirt, pillow shams, and accent pillows. Items are usually made with microfiber, are machine washable, and are designed to keep their shape for years to come. Select from a wide range of available patterns and colors specially designed to show off your unique flair. Fleece is a versatile and warm favorite, popular with families who have children due to its softness on the skin. A blanket of fleece is a great addition to a cozy bed. Cotton is a timeless classic, enjoyed by many cultures for centuries. The soothing touch of cotton sheets is the key to its longtime popularity. Sheets are available in a variety of weights so you can get just the right amount of warmth or breeziness you desire for your nighttime serenity. The search for the perfect pillow can be a daunting task for many, so why not make the easy choice--go with your conscience and go green! Contribute to making the Earth a better place while you sleep by choosing pillows made with Eco-Smart, a high-quality, soft yet firm filler made entirely from recycled plastic bottles. Last of all, don't forget to add a bed bug liner for your mattress and box springs to keep your space secure from pests. Liners available are unlike the hot, noisy plastic monstrosities of the past. Today's liners are produced from stretch polyester knit fabric to maximize both protection and comfort, making them quiet and cool to sleep on. Choosing the best linens for the bed is an easy and satisfying experience for sleepers who care about style and a good night's rest. Check out the many great options and get started building your perfect bed today! The benefits of buying kitchen linens at bulk prices are many. Most establishments which wish to purchase kitchen linens in bulk are in the tourism and hospitality business. These establishments include places like motels, hotels, resorts, restaurants, bars and other areas with large kitchens. Additionally, Schools and cafeterias should consider purchasing their kitchen linens at wholesale. Kitchen linens include any and all of the cloth articles that the kitchens or dining rooms would need in any of the establishments listed above. For example, table cloths, cloth napkins, dish rags, table rags and table runners are all considered kitchen linens. Restaurants, hotels, and bars will especially need massive amounts of these items as they will inevitably become stained or torn over time, and new linens will need to be purchased. Even if some linens are not necessarily stained or torn, they will eventually wear out from hundreds of washes. Having nice looking kitchen linens and dining room linens for high-end places like resorts and fancy restaurants is a must to keep customers coming back. The first reason that purchasing kitchen linens in bulk is a good idea because it will save establishments like restaurants and bars money in the long run. It goes without saying that large establishments with kitchens and dining rooms will need to continue to purchase new linens time and again, so buying a large quantity altogether will save money down the line. When saving money by buying kitchen linens in bulk, establishments such as hotels and restaurants or bars will also be getting the best Bang for their buck. In other words, fine linens will be able to be purchased at a lower price, so any establishment that needs linens for their dining rooms or kitchens will be able to put their best foot forward. Choosing the right blanket to enhance sound sleep, encourage relaxation, and add style to a bedroom or living room can be a real challenge. Many blankets made from conventional materials such as cotton or wool can feel either too hot, too flimsy, or too scratchy to provide a maximum level of comfort. When it comes to finding a soft, comfortable, and attractive blanket that helps users feel cozy in nearly any climate or situation, polar fleece blankets are one of the most popular choices available. And it's no wonder they're in such high demand because these blankets are not only amazingly soft, they're also lightweight, durable, and warm. Besides being used for everyday bedding and snuggling up on the couch, these versatile blankets are perfect for packing up to take along for car trips, slumber parties, or camping trips. 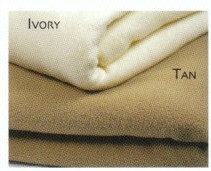 These blankets are made from 100% polyester, and they come in both Twin size (66" x 90") and Queen size (90" x 90") options. They are popular for use in homes, and can also be found as a standard bedding choice for quality hotels throughout the hospitality industry. They're machine washable, and they come in a variety of colors, such as tan, ivory, sage and blue to match a whole host of different bedroom decor options. They make the ideal complement to a variety of different bedspreads or comforters to create a fashionable bedding arrangement. During warm summer months, they can be used in place of a comforter directly over bed sheets for a more comfortable night's sleep. These blankets can also be used to add an inviting accent to a couch, love seat, or large chair in the living room. With all the benefits polar fleece blankets have to offer, they are a great value for anyone in need of affordable bedding, living room blanket solutions. Wrap yourself in the warmth and coziness of a thick, 100% cotton blanket. The ultimate in luxury, this waffle-style weave blanket is ideal for sleeping, sitting on the couch or for use during meditation and yoga. The Santa Barbara blanket is thick and made of durable yarn, with a tightly woven pattern that does not snag easily. These wholesale quality blankets come in natural colors that everyone will undoubtedly love. Santa Barbara thick cotton blankets are machine-washable, keeps its shape, does not pill, and will not shrink. It only gets softer and better. Use it as a bedspread on its own during the warmer season or add it under your comforter to chase the chill away on a frosty winter night. The Santa Barbara blanket is a perfect choice when you want an extra layer that is warm but breathable. The weight and the weave will keep you relaxed through every season of the year. This versatile blanket comes in three sizes with nicely finished edges. For use as a bedspread, you might choose the king size to tuck under the pillows and drape over the whole bed and comfortably down to the floor. Some people are not comfortable under a quilt or duvet but prefer a cotton blanket. A Santa Barbara blanket is wonderful to snuggle up under, without being too bulky and gives a nice clean look. Covering the bed with a Santa Barbara blanket is sure to make anyone who walks into the room relax and smile.